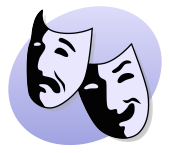 These plays contain darker themes such as death and disaster. Often the protagonist of the play has a tragic flaw, a trait which leads to their downfall. Tragic plays convey all emotions and have very dramatic conflicts. Tragedy was one of the two original play types of Ancient Greece. Some examples of tragedies include William Shakespeare's Hamlet, and also John Webster's play The Duchess of Malfi.